Magnetic resonance imaging (MRI) may soon become even more useful thanks to a ’phantom’ for calibrating MRI machines that has been developed at the National Institute of Standards and Technology (NIST). 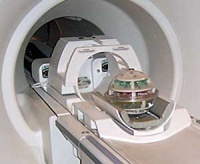 A prototype of the phantom, named Phannie, was developed in collaboration with the standards committee of the International Society for Magnetic Resonance in Medicine (ISMRM). Traceable MRI calibrations are expected to enable accurate, quantitative measurements of tumours that can be reproduced across many different patients, scanners and clinics over time – and potentially reduce medical costs. The NIST phantom itself is a plastic sphere about the size of a person’s head, filled with water-bathed grids of 100 small plastic spheres containing various salt solutions that become magnetised in a magnetic field. By making MRI scans of Phannie, users can evaluate the image contrast, resolution and accuracy of distance and volume measurements. A machine’s performance can then be compared to standards, to other MRI machines and to itself over time. MRI scanner performance may drift, or different machines may produce different images of the same patient. The new phantom is intended to help generate more accurate and consistent images and reduce medical costs by improving image quality and reliability. The phantom will assist multi-site clinical trials that use quantitative MRI to test the efficacy of novel drugs. A number of specialised MRI phantoms already exist, but NIST claims to have designed the first that can ensure that MRI system properties and image data are traceable to international system of units (SI) standards. The ISMRM Ad Hoc Committee on Standards for Quantitative MR defined the phantom requirements and values. NIST modelled and built the prototype device and also developed and tested various solutions used in the mini-spheres as contrast-enhancing agents and measurement reference markers. Phannie will now undergo testing at other institutions for about four months.